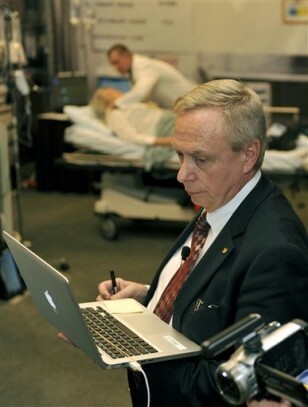 William Hamman watches data on a computer as he supervises doctors during a cardiology simulation on March 14, 2010 at the Georgia World Congress Center in Atlanta. Hamman, an airline captain who lives in Michigan, claimed to be a cardiologist and trained other doctors in teamwork. But he never got a medical degree.